All of my books are written for BOTH patients and caregivers and suitable for Christ-followers, as well as those who only have a minimal belief in God. 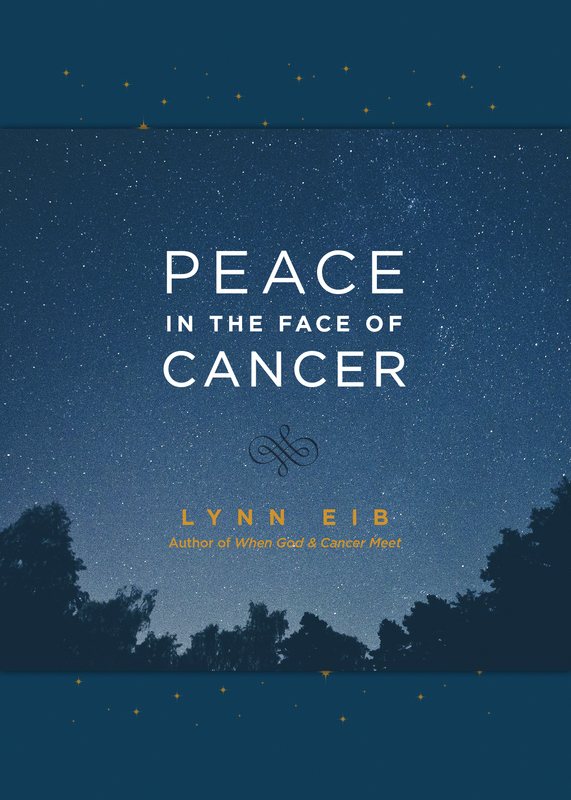 Peace in the Face of Cancer–Golden Scroll 2017 Nonfiction Book of the Year! Millions of us are living in the shadow of cancer. Some are hoping to beat the odds and be cancer-free, while others know they are facing cancer for the long haul. And millions more of us are standing by someone with a cancer diagnosis and often feeling rather helpless as we grapple with the uncertainty a life-threatening illness brings. Whether the cancer is considered “in remission,” “cured,” or “chronic,” it is possible to find peace as we face it. 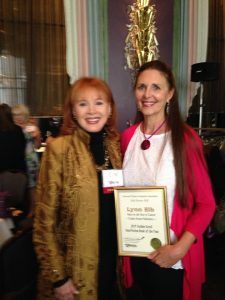 I share how to live well as a cancer survivor from the moment you are diagnosed through the rest of your life. I weave the story of her own experience as a long-time cancer survivor and those of other survivors around the world into this hope-filled book. In these pages you’ll discover how to foster peace in your own home and life, as well as how to find God’s supernatural peace in your heart and mind—regardless of your or your loved one’s medical prognosis. This one is another beautiful gift book with a leather cover (like 50 Days of Hope) and the stars in the background are shiny gold foil–pretty excited for its release! The book retails for $15.99 and is available at both religious and secular bookstores, as well as online. When GOD & Cancer Meet— 100,000+ copies in print! When God & Cancer Meet is a book of powerful stories about cancer patients and their families who have been touched by God in miraculous ways. Sometimes God took the cancer out of them and sometimes He took them out of the cancer. But always, always He touched them with His divine love and met their deepest needs. You can believe their stories because they have been there. You can believe me because I have been there. You can believe God because He promises He will be there. This is a realistic book. It’s real because it admits that some people get cured of cancer and some don’t. It’s real because it acknowledges there are no easy answers to the unfairness of life. It’s real because it doesn’t pretend that your faith in God will keep hard times away. But it’s also real because it shows real people trusting in a real God in real life, who found real joy, real peace, real hope, real strength and real encouragement. It’s real because it shows what can happen when God and cancer meet. 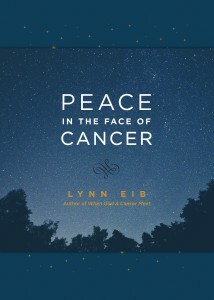 If you don’t want to be defeated by cancer—no matter what it does or has done to your loved one, this is a book for you. The book is in its 17th printing and retails for $14.99 and is available at both religious and secular stores, as well as online. The SPANISH EDITION is out of print 🙁 but some new and used copies remain online. If you are interesting in bulk ordering this title, email me. You’ve just heard a diagnosis that shakes your world: it’s cancer. What you long for most is the hope that everything will be okay. 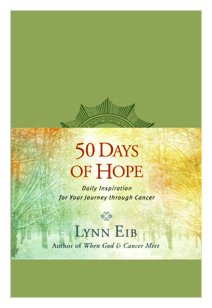 Join me on this 50-day journey as I draw timeless wisdom from my books and share uplifting NEW stories of people who have walked in your shoes and discovered that when God and cancer meet, hope is never far away. This beautiful, imitation leather gift book is packed with the daily dose of encouragement needed by both cancer patients and their caregivers. Every day features a short, true, hope-filled story and a prayer. It’s available for $13.99 at both religious and secular stores, as well as on-line. ESPECIALLY GOOD FOR: Newly diagnosed patients and caregivers, including those who don’t like to read. 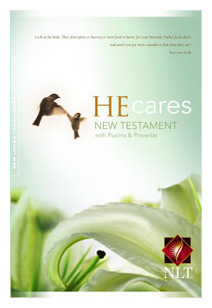 TYNDALE IS CONSIDERING PUBLISHING A SLIGHTLY REVISED EDITION OF HE CARES. IF SO, IT FINALLY WOULD BE AVAILABLE IN BOOKSTORES! I’LL KEEP YOU POSTED! He Cares is a book about someone who not only cares about your diagnosis and prognosis, but has the power to meet your deepest needs. That someone is the One who knows you best and loves you most, because He created every cell in your body. That someone is God. Inside, you will find God’s encouraging message to those who are dealing with serious illness. It’s a message of hope and healing. And it’s filled with promises and perfect peace. Why? Because He Cares. Whether you love to read Scripture or have never read a single Bible verse before, I believe you will be touched by just how much God really does care about you. He Cares retails for $9.99 and is temporarily out-of-print, but gently used copies are available on Amazon and bulk discount copies are available from me. When I finished treatment, I was really surprised that life simply didn’t “go back to normal.” Instead I often found myself with more questions and anxiety than I had DURING treatment. 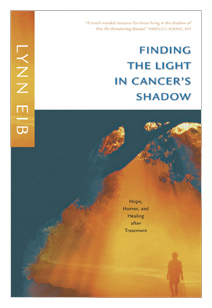 So I wrote a book for myself and any other survivors (and their loved ones) who have finished their initial cancer treatment (surgery, chemo and/or radiation) and are now living in cancer’s “shadow.” The book’s message also will speak to those who are living with chronic cancers and therefore always under cancer’s shadow. Each chapter answers a question posed by cancer survivors and the answers are illustrated through true stories and humor. How do I know when I’m a survivor? Is everyone as paranoid as I am? How do I turn off that little voice of fear? Do I positively have to stay positive? How do I keep (get) a sense of humor? The book is similar to When God & Cancer Meet in that it is filled with true stories of hope and healing, but it’s also different in that each chapter has two or three patient stories instead of just one long story. Also, more humor is sprinkled throughout the book and the book probably won’t make you quite as “teary” as the first! Still, I believe you’ll feel God’s powerful touch and continue to believe that He can meet you at your deepest need. This book is out-of-print, but some new and used copies still are available online. No one wants to need a grief book. But sooner or later we all face the death of someone we love. Whether the loss is through an unexpected tragedy or a prolonged illness, one of the things that helps most is to encounter others who have walked similar roads and faced similar questions. I believe When God & Grief Meet is a powerful message for mourners. Each chapter contains real-life inspiring stories of grievers from all walks of life who have faced difficult losses. The focus of the stories is not the circumstances of how the loves ones died, but how those left behind are finding the strength to continue living without them. 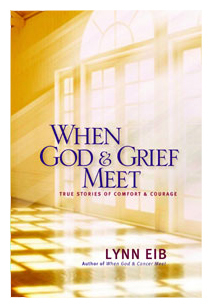 Written in a heartfelt and hopeful style, this book contains warm insights and true stories illustrating that God is close to the brokenhearted and can supernaturally comfort and encourage those whose minds are filled with doubts and whose hearts are filled with grief. Readers are certain to find a story to which they can relate: loss from a car accident, congenital illness, suicide, plane crash, murder, cancer etc. Stories include the loss of a child, teenager, adult child, spouse, parents, and even an entire immediate family. The book retails for $14.99 and is available as both religious and secular bookstores, as well as on-line.